Got EQ? Get Promoted Faster! What separates mediocre professionals from really great and successful professionals? Technical and hard skills may qualify you for a position and get you the interview but your soft skills and emotional intelligence will get you the job. They make you stand out from the hundreds of others interviewed. They are what makes you sought after as a go-to problem solver. 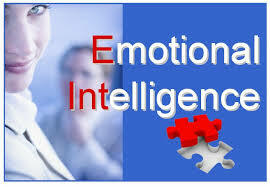 Career Builder.com’s surveys always point out that employers value emotional intelligence over IQ! someone if s/he demonstrated low emotional intelligence. My own experience has been that Fortune 200 companies purposely interview candidates to identify which of them display high EQI. Experience has shown companies that their ultimate success is their people and it is those who can listen, develop rapport, solve problems and tolerate stress who are most effective. Hands down, two of the most important skills are communication and positive attitude. On the other hand, almost 90% of employees who are fired, within their first couple of years, had negative behaviors which impacted internal and/or external customer relationships. That compares to only 10% of people who were fired due to inability to perform the tasks assigned. So how do you assess your own soft skills? Here are some questions to give yourself insight. Caution: answer truthfully and honestly. Self awareness plays a critical role here and no improvement can be made until we are aware of our strengths and weaknesses. Be prepared to use examples of how you have used emotional intelligence during your interview. ← New Year, New Career? I have been in the position of hiring someone and in the position of being employed. What you say about emotional intelligence is important and applicable to any job in which working with others is necessary. Persons hiring want to build a team and an environment where people work together and share complimentary strengths. In professional organizations in which service is important, skills only go so far. It is applying those skills to a particular context that is important. When a person is arrogant, doesn’t get along, texts during meetings, and is critical of fellow employees and upper management, his or her days may be numbered. When a negative attitude is exhibited in an interview, the person will not likely be employed no matter what skills they have. Get help to find out how you come across in an interview and what your level of emotional intelligence really is. Ask the people you work with. They know for sure. Patricia or someone like her will help you to change and become a better employee and/or employer.